This months Lindy’s Stamp Gang Color Challenge colors have some of the most beautiful jewel toned colors I have ever worked with. They are also some of my favorite colors. I love the violet and blues together. Throw in touch of green and you can’t go wrong. Experimenting with mixing some of the colors together, gave me a variety of tones for the flowers. For the flowers I used Sweet Violet Purple Teal and Pretty in Pink Pink. I just searched the internet for flowers in the blue family that would match the colors on the challenge. The photo of these morning Glorys were perfect! To create the base of my layout, I mounted a piece of white card stock onto piece of thick corrugated cardboard with ModPodge. I coated the white cardstock with some gesso. This gave my base the feeling of canvas. When it was dry, I peeled back the paper and top layer of cardboard around the edges of the base, curled back some cutouts and wrinkled the corners. I sprayed it, used molding paste, then did some masking and little stamping for added texture. I fell in love with the little nests filled with Robins eggs that Gabrielle Pollacco creates for her projects and had to give it try. I used excelsior for the nest, and the eggs were rolled from Fimo Clay. I added Hydrangea Blue spray and touch of Whale Watch to some gesso and created the robins egg blue to paint the eggs. I used some black acrylic pint watered down a bit to speckle the eggs, Just glue them into the nest. They are adorable and easy to create. The die cut leaves and the stamen in the flowers were sprayed with Maidenhair Fern Green. I mounted the photo on piece of corrugated cardboard that was primed with gesso, then spayed with Sweet Violet Purple Teal. I coated the Blue Fern Studios Chipboard with white gesso, let it dry, then heat embossed it with Hydrangea Blue Mauve embossing powder. Lindys embossing powder has a two/toned effect that is beautiful! When the light hits it, you can see a bit of violet in this blue color. I really love this months Lindy’s Color Challenge colors. I hope you join us this month with your own creations!! I know I would love to see what you do!! 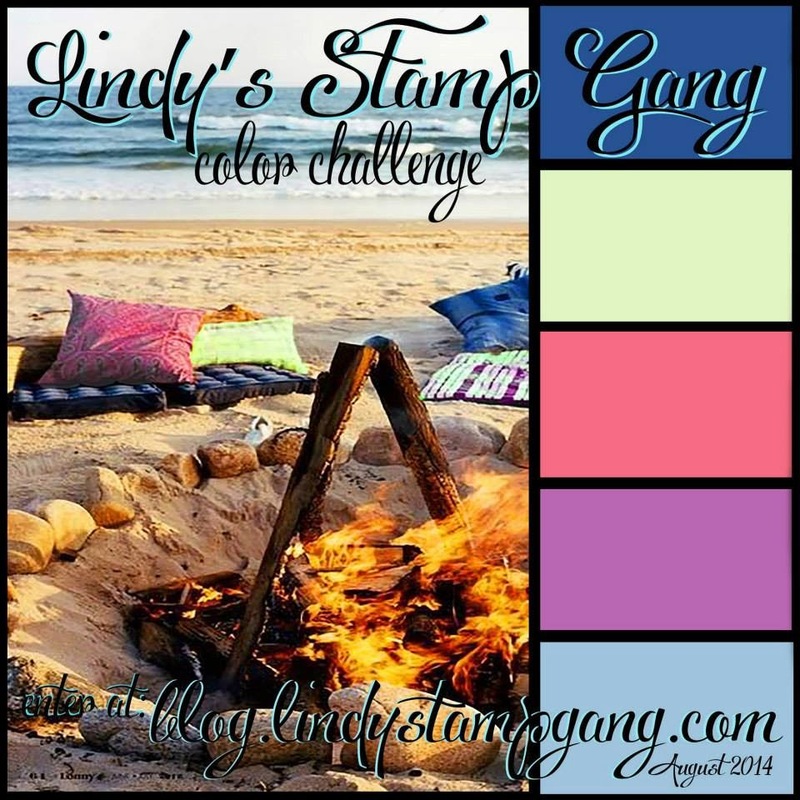 Grab Lindy’s Limited Edition August 2014 Challenge Mega Set to get the color party started!! Here re the colors in this months challenge. They are sure to become some of your “go to” colors. Super colorful page Lisa! Love those flowers!